Hypocalcemia; Pregnancy; Hypoparathyroidism; Calcium; Vitamin D.
Though hypocalcemia in pregnancy is not often reported in the literature, it occurs in cases of hypoparathyroidism and in mothers with severe dietary inadequacy. Hypocalcemia during pregnancy can pose numerous problems to the mother and fetus. It is associated with hypertensive disorders and can increase the risk of numerous problems such as preeclampsia and fetal growth disorders. In this review, we summarize the challenges physicians face diagnosing and managing hypocalcemia during pregnancy. A multidisciplinary team including endocrinologists and obstetricians is warranted to ensure appropriate treatment and optimal outcomes. Calcium levels affect many extracellular and intracellular processes. These include neural transmission, membrane stability, bone structure, blood coagulation, muscle movement, and intracellular signaling. It is also an important cofactor for hormonal secretion in endocrine organs.1 For optimal and normal functioning of these processes, the total serum calcium concentrations need to be normally maintained within the very narrow range of 8.5 and 10.5 mg/dL (2.12 to 2.62 mmol/L).2,3 Hypocalcemia, a common metabolic derangement observed in hospitalized patients (both medical and surgical), is caused by loss of calcium from circulation or insufficient entry of calcium into the circulation. Around 10–20 mEq/day of calcium is utilized by the body. In operational terms, calcium balance is determined by the relationship between calcium intake, calcium absorption, and excretion. Daily, the calcium removed from bones is replenished by an equal amount (500 mg). The amount of calcium absorbed by the intestines is equated by urinary calcium excretion. Despite calcium fluctuations, in a healthy person, the levels of ionized calcium are tightly regulated by the two main calcium regulating hormones (parathyroid hormone (PTH) and calcitonin) and the prohormone, vitamin D, and three organs (bone, kidney, and small intestine) through complex feedback loops.5 Table 1 summarizes the actions of each hormone and the role of the organs in calcium regulation. Insufficient levels of vitamin D or PTH or resistance to these hormones causes chronic hypocalcemia. Serum pH, protein, and anion levels also play a role in serum calcium levels. According to the National Institute of Health, the recommended daily calcium dietary allowance in normal females aged 19–50 years during pregnancy and lactation is 1000 mg, and 1300 mg in normal females aged 14–18 years old. PTH (PTH’s function is to control calcium concentration in the extracellular fluid using their membrane receptor, which acts as a calcium sensor). The ionized calcium in the extracellular fluid is the principal signal regulating PTH secretion. PTH secretion is stimulated as calcium level decreases. Calcium also regulates PTH gene activity. Kidney - Rapid effect on kidney causing reabsorption of calcium and excretion of phosphorus to maintain calcium level and prevent adverse effects of elevated phosphate from bone resorption. Calcium loss through urine is reduced. Bones - Increased rate of calcium and phosphate release from the bones by PTH binding to the osteoblasts causing release of cytokines and increased osteoclast activity. There is net loss of bone and rise in blood calcium levels. 1,25-(OH)2 vitamin D (calcitriol) (Vitamin D must be metabolically activated by PTH stimulation before it can regulate calcium levels and influence skeletal remodelling. 1,25-(OH)2 vitamin D decreases PTH gene expression creating a negative feedback loop for the regulation of PTH. Activation through hydroxylation stimulated as calcium levels decrease due to increased PTH secretion). Calcitonin (which is produced by the parafollicular (or C) cells of the thyroid, has the opposite effect on blood calcium levels as PTH. Very low-level secretion when calcium levels are low). Small intestine - 1,25-(OH)2 vitamin D promotes enhanced absorption of dietary calcium from the small intestine through the intestinal epithelial cell. Bones - 1,25-(OH)2 vitamin D activates osteoblasts/osteoclasts leading to calcium and phosphate release from the bone. Kidney - Renal excretion of calcium is decreased due to enhanced tubular reabsorption stimulated by elevated PTH and vitamin D.
Although calcitonin has a pharmacologic role in calcium disorders, its physiologic role in calcium homeostasis is unclear. When serum calcium increases, calcitonin decreases blood calcium levels by inhibiting osteoclasts, stimulating osteoblasts, inhibiting bone resorption, and stimulating calcium excretion by the kidneys. It does not play a major role in humans at least in adults. PTH: parathyroid hormone; 1,25-(OH)2 vitamin D: 1,25-dihydroxy vitamin D.
Total serum calcium normally falls throughout pregnancy, thus a healthy and balanced maternal diet is crucial since the diet needs to take care of the women’s usual nutritional needs as well as the needs of the growing fetus, enabling the mother to maintain her stores of nutrients and those required for fetal health as well as for the future breastfeeding period.8 Many physiologic changes occur during pregnancy resulting in an increase of red blood cells and plasma volume and a reduction of micronutrients and circulating nutrient-binding proteins. In most developing countries, poor nutrition combined with the usual physiologic pregnancy changes can lead to micronutrient deficiency states9 like calcium deficiency, which can have detrimental effects on bone health since the bone stores most of the body’s calcium and replaces extracellular fluid losses. Women are at risk when they already have hypocalcemia and have to undergo the strain on their bodies to meet the normal maternal needs with the additional needs of calcium during pregnancy and lactation. The mother adapts in various ways to meet the additional calcium needs. Though similar, the increased demands during pregnancy and lactation may involve different alterations in intestinal calcium absorption and excretion, mobilization of calcium from the maternal skeleton, and/or rates of bone calcium turnover10,11 as shown in Figure 1. Figure 1: Contrasting calcium homeostasis in human pregnancy and lactation, as compared to normal. The thickness of arrows indicates a relative increase or decrease with respect to the normal and non-pregnant state. The direct and possible indirect stimulation of plasma prolactin is also shown. The main adaptation through which women meet the calcium demands of pregnancy is by the doubling of their intestinal calcium absorption driven by calcitriol and other factors as early as 12 weeks gestation.10 This early increased absorption of calcium may allow the maternal skeleton to store more calcium in advance of the peak fetal demand that occurs in the third trimester. The 24-hour urine calcium also increases by 12 weeks gestation and may exceed the normal range.12 While in the fasting state, urine calcium can be normal or low; the increase in the 24-hour urine calcium indicates an increase in intestinal calcium absorption. 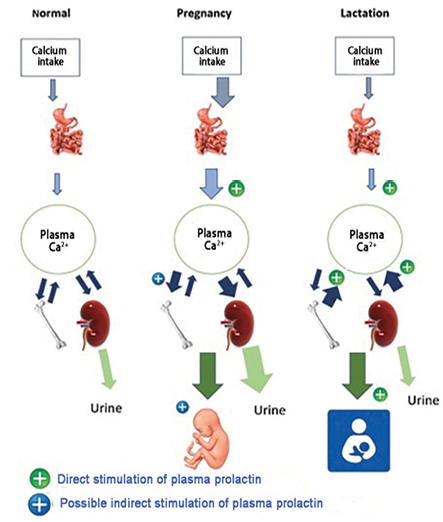 Elevated calcitonin values in pregnancy may also induce renal calcium excretion. Contrary to notions that the women may suffer severe deficiency due to pregnancy and lactation, a longitudinal study shows that despite increased urinary calcium losses; increased maternal intestinal calcium absorption appeared to provide the calcium required for fetal bone mineralization, without necessitating a substantial net loss in maternal bone mineral.11,13 In fact, animal studies in mice show that the bone mineral content increases by 5–10% during pregnancy.14,15 This increase in bone mineral content probably protects the maternal skeleton from excessive demineralization and fragility during lactation. However, such detailed and comparative studies are not available in humans due to fear of radiation. Several studies are there but they lack comparative baseline values. Some data is available for women who terminated their pregnancy in the first trimester which indicates increased bone resorption, but there are no values taken for full-term mothers.16,17 Despite these limitations, one may cautiously conclude that bone turnover begins to increase as early as 10 weeks gestation12 and is mainly increased towards the end of gestation to prepare for transfer of calcium during the third trimester. A systematic review concluded that despite the transfer of calcium from the maternal skeleton to the fetus, the eventual return of maternal bone mineral density (BMD) to pre-pregnancy values suggests that maternal bone loss may not be permanent.18 Between 3–7% of maternal bone density is temporarily lost during lactation, but it is recovered after weaning (depending on factors like lactation duration and postpartum amenorrhea) and differ by skeletal site.19 Many studies show that there is a loss of BMD during pregnancy and there is still a loss of BMD nine months postpartum for mothers that are still breastfeeding. BMD returns to pre-pregnancy values for all sites at 19 months postpartum independent of breastfeeding duration/status.20,21 Even with frequent pregnancies, bone recovers completely for most women. Supplementary maternal calcium intake does not avert bone loss during lactation or boost skeletal recovery after weaning.19 Pregnancy and lactation are not related to an increased risk of osteoporotic fractures,19,22 but BMD increases after both pregnancy and lactation, and may have a protective effect because of the structural rebuilding that occurs after weaning.23–25 During early pregnancy, there is a considerable increase in calcium absorption. Gradually throughout pregnancy, the part of protein bound in serum declines while the concentrations of free ions seem to remain constant. Vitamin D, calcitonin, and PTH interact to steadily maintain the homeostatic ionic calcium control during pregnancy and lactation as shown in Figure 1. The full-term neonate has about 30 g of calcium which is drawn during pregnancy from the maternal calcium stores to meet its needs for fetal skeletal mineralization and to maintain normal physiological processes across gestation.26,27 This active transport increases from only several milligrams per day in the first trimester to > 250 mg/d during the last trimester13,27,28 putting the condition of the mother’s bones and teeth at risk. Markedly high level of total calcium concentration in cord blood compared to maternal serum17 showed that 80% of the calcium found in the fetal skeleton at birth crossed the placenta during the third trimester and is mostly derived from dietary absorption of calcium during pregnancy. The suckling neonate requires more calcium in breast milk during six months of exclusive lactation than its fetal requirement, and the baby continues to draw calcium from the mother through breast milk for the duration of lactation. Calcium losses through human breast milk denote ~260 mg/L29 during the breastfeeding period. Though hypocalcemia in pregnancy is not often reported in the literature, it occurs in cases of hypoparathyroidism and in mothers with severe dietary inadequacy.30,31 Low calcium and magnesium levels have been associated with hypertensive pregnancy disorders according to MJ Keirse’s unpublished observations in 2000,9 but a causal effect has not been revealed. For pregnant mothers, changes in the serum chemistries and calciotropic hormones can easily be mistaken as a disorder of calcium.37 During pregnancy, hemodilution causes the serum albumin and hemoglobin to decrease while the albumin remains low until birth. This fall in albumin causes the total serum calcium to fall to levels normally associated with symptomatic hypocalcemia. During pregnancy, serum phosphate and magnesium levels remain normal while the ionized calcium remains constant during gestation and this shows that the fall in total calcium is due to pregnancy and can be ignored. Any doubt as to whether maternal hypocalcemia is present or not is cleared by computing the albumin-corrected total calcium level or measuring the ionized calcium. The causes of hypocalcemia in pregnancy are summarized in Table 2. The signs and symptoms of hypocalcemia are dependent on the severity, rapidity of development, the rate of decline of serum calcium, and duration of the hypocalcemia varying from an asymptomatic biochemical abnormality to a life-threatening disorder. Mild hypocalcemia is not uncommon, and most patients will have no symptoms while many have vague muscular aches and pains. Many do not realize they are deficient until noticeable problems occur. The symptoms and signs of hypocalcemia are summarized in Table 3. Table 3: Signs and symptoms of hypocalcemia. Treatment of pregnant or nursing women with hypoparathyroidism is a challenge due to complications arising from both under- or overtreatment. Maternal hypocalcemia due to hypoparathyroidism has been linked with intrauterine fetal hyperparathyroidism and fetal death while overtreatment leads to maternal hypercalcemia, which can cause complications such as abortion, stillbirth, perinatal death, neonatal tetany, and suppression of the fetal and neonatal parathyroid glands. Recombinant PTH (teriparatide) is contraindicated in pregnant and lactating women with hypoparathyroidism due to risks of mild growth retardation and reduced motor activity in offspring at higher doses. One case report illustrates the feasibility of treating hypoparathyroidism during pregnancy with a continuous subcutaneous infusion of recombinant PTH (1–34).67 There are no adequate and well-controlled studies in pregnant women. Therefore, PTH (1–34) should not be given as a routine treatment before adequate and well-controlled data proving its safety have become available. Frequent monitoring of calcium levels every 3–4 weeks throughout pregnancy as well as within one week postpartum is important to ensure normal calcium levels in both mother and fetus. Furthermore, monitoring should continue during lactation every 4–6 weeks, as well as during the weaning period to ensure the stability of maternal calcium levels. Women are at risk when they already have hypocalcemia and must undergo a strain on their bodies to meet the normal needs with the additional needs of calcium during pregnancy and lactation. Many studies show that there is loss of BMD during pregnancy and there is still loss of BMD at nine months postpartum for breastfeeding mothers, which returns to pre-pregnancy values for all sites at 19 months postpartum independent of the breastfeeding duration. Though the mother adapts to this additional requirement, this need could be met by increased dietary calcium intake and calcium supplementation to ensure optimal bone and extra-skeletal health in a woman throughout her life, especially during pregnancy and lactation. Special consideration is necessary for the treatment of women with hypoparathyroidism during pregnancy and nursing. In patients with hypoparathyroidism, 1,25-(OH)2 vitamin D replacement should be used only when needed. A multidisciplinary team including endocrinologists and obstetricians is warranted to ensure appropriate treatment and optimal outcomes. 1. Ross AC, Taylor CL, Yaktine AL, Valle HB, editors. Institute of Medicine (US) Committee to Review Dietary Reference Intakes for Vitamin D and Calcium; Dietary reference intakes for calcium and vitamin D. Washington (DC): National Academies Press US; 2011. 3. Jafri L, Khan AH, Azeem S. Ionized calcium measurement in serum and plasma by ion selective electrodes: comparison of measured and calculated parameters. Indian J Clin Biochem 2014 Jul;29(3):327-332. 4. Fong J, Khan A. Hypocalcemia: updates in diagnosis and management for primary care. Can Fam Physician 2012 Feb;58(2):158-162. 5. Peacock M. Calcium metabolism in health and disease. Clin J Am Soc Nephrol 2010 Jan;5(Suppl 1):S23-S30. 6. Cooper MS, Gittoes NJ. Diagnosis and management of hypocalcaemia. BMJ 2008 Jun;336(7656):1298-1302. 7. Murphy E, Williams GR. Hypocalcaemia. Medicine 2009;37(9):465-468. 8. Mridula D, Mishra CP, Chakraverty A. Dietary intake of expectant mother. Indian J Nutr Diet 2003;40(1):24-30. 9. Ladipo OA. Nutrition in pregnancy: mineral and vitamin supplements. Am J Clin Nutr 2000 Jul;72(1)(Suppl):280S-290S. 10. Cross NA, Hillman LS, Allen SH, Krause GF, Vieira NE. Calcium homeostasis and bone metabolism during pregnancy, lactation, and postweaning: a longitudinal study. Am J Clin Nutr 1995 Mar;61(3):514-523. 11. Ritchie LD, Fung EB, Halloran BP, Turnlund JR, Van Loan MD, Cann CE, et al. A longitudinal study of calcium homeostasis during human pregnancy and lactation and after resumption of menses. Am J Clin Nutr 1998 Apr;67(4):693-701. 12. Kovacs CS, Fuleihan Gel-H. Calcium and bone disorders during pregnancy and lactation. Endocrinol Metab Clin North Am 2006 Mar;35(1):21-51, v.
13. Marie PJ, Cancela L, Le Boulch N, Miravet L. Bone changes due to pregnancy and lactation: influence of vitamin D status. Am J Physiol 1986 Oct;251(4 Pt 1):E400-E406. 14. Sharpe CJ, Fudge NJ, Kovacs CS. A rapid 35% flux in bone mass occurs during pregnancy and lactation cycles in mice [abstract]. International Bone and Mineral Society Meeting,Osaka, Japan, June 3–7, 2003. Bone 2003;32(Suppl):S227. 15. Purdie DW, Aaron JE, Selby PL. Bone histology and mineral homeostasis in human pregnancy. Br J Obstet Gynaecol 1988 Sep;95(9):849-854. 16. Ensom MH, Liu PY, Stephenson MD. Effect of pregnancy on bone mineral density in healthy women. Obstet Gynecol Surv 2002 Feb;57(2):99-111. 17. Kalkwarf HJ, Specker BL. Bone mineral changes during pregnancy and lactation. Endocrine 2002 Feb;17(1):49-53. 18. Møller UK, Við Streym S, Mosekilde L, Rejnmark L. Changes in bone mineral density and body composition during pregnancy and postpartum. A controlled cohort study. Osteoporos Int 2012 Apr;23(4):1213-1223. 19. Karlsson MK, Ahlborg HG, Karlsson C. Maternity and bone mineral density. Acta Orthop 2005 Feb;76(1):2-13. 20. Matsumoto I, Kosha S, Noguchi S, Kojima N, Oki T, Douchi T, et al. Changes of bone mineral density in pregnant and postpartum women. J Obstet Gynaecol (Tokyo 1995) 1995 Oct;21(5):419-425. 21. Bjørnerem A, Ahmed LA, Jørgensen L, Størmer J, Joakimsen RM. Breastfeeding protects against hip fracture in postmenopausal women: the Tromsø study. J Bone Miner Res 2011 Dec;26(12):2843-2850. 22. Melton LJ III, Bryant SC, Wahner HW, O’Fallon WM, Malkasian GD, Judd HL, et al. Influence of breastfeeding and other reproductive factors on bone mass later in life. Osteoporos Int 1993 Mar;3(2):76-83. 23. Woodrow JP, Noseworthy CS, Fudge NJ, Hoff AO, Gagel RF, Kovacs CS. Calcitonin/calcitonin gene-related peptide protect the maternal skeleton from excessive resorption during lactation (abstract). J Bone Miner Res 2003;18(Suppl 2):S37. 24. Canal-Macias ML, Roncero-Martin R, Moran JM, Lavado-Garcia JM, Costa-Fernandez M del C, Pedrera-Zamorano JD. Increased bone mineral density is associated with breastfeeding history in premenopausal Spanish women. Arch Med Sci 2013 Aug;9(4):703-708. 25. Kazzi GM, Gross CL, Bork MD, Moses D. Vitamins and minerals. In: Gleicher N, Buttin L, eds. Principles of medical therapy in pregnancy. 3rd ed. Old Tappan, NJ: Appleton and Lange; 1998. p. 311-319. 26. Sparks JW. Human intrauterine growth and nutrient accretion. Semin Perinatol 1984 Apr;8(2):74-93. 27. Schauberger CW, Pitkin RM. Maternal-perinatal calcium relationships. Obstet Gynecol 1979 Jan;53(1):74-76. 28. Kovacs CS. Calcium and bone metabolism in pregnancy and lactation. J Clin Endocrinol Metab 2001 Jun;86(6):2344-2348. 29. Schanler RJ, Oh W. Composition of breast milk obtained from mothers of premature infants as compared to breast milk obtained from donors. J Pediatr 1980 Apr;96(4):679-681. 30. Stabile I, Chard T, Grudzinskas G, eds. Clinical obstetrics and gynaecology. London: Springer; 1995. p. 96-97. 31. Mahadevan S, Kumaravel V, Bharath R. Calcium and bone disorders in pregnancy. Indian J Endocrinol Metab 2012 May;16(3):358-363. 32. Kumar A, Agarwal K, Devi SG, Gupta RK, Batra S. Hypocalcemia in pregnant women. Biol Trace Elem Res 2010 Jul;136(1):26-32. 33. Benali A, Demmouche A. Calcium deficiency among pregnant women and their newborns in Sidi Bel Abbes Region, Algeria. J Nutr Food Sci 2014;4:6. 34. Sadaf S, Amna J, Fareeha R, Faseeha R, Ahmad J. Frequency of hypocalcemia in women with preeclampsia at a tertiary care hospital. Pakis J Med Heal Sci 2017;11(2):773-776. 35. Schafer AL, Shoback DM. Hypocalcemia: diagnosis and treatment. [Updated 2016 Jan 3]. In: De Groot LJ, Chrousos G, Dungan K, Feingold KR, Grossman A, Hershman JM, et al, editors. Endotext [Internet]. South Dartmouth (MA): MDText.com, Inc; 2000. [cited 2018 September 17] Available from: https://www.ncbi.nlm.nih.gov/books/NBK279022/. 36. Parent X, Spielmann C, Hanser AM. [“Corrected” calcium: calcium status underestimation in non-hypoalbuminemic patients and in hypercalcemic patients]. Ann Biol Clin (Paris) 2009 Jul-Aug;67(4):411-418. 37. Kovacs CS. Calcium metabolism during pregnancy and lactation. [Updated 2015 Mar 10]. In: De Groot LJ, Chrousos G, Dungan K, Feingold KR, Grossman A, Hershman JM, et al, editors. Endotext [Internet]. South Dartmouth (MA): MDText.com, Inc; 2000. [cited 2018 September 17]. Available from: https://www.ncbi.nlm.nih.gov/books/NBK279173/. 38. Urbano FL. Signs of hypocalcemia: Chvostek’s and Trousseau’s signs. Hosp Physician 2000;36(3):43-45. 39. Sibai BM, Moretti MM. PIH: Still common and still dangerous. Contemp Ob Gyn 1988;(February):57-70. 40. Kolata G. Does a lack of calcium cause hypertension? Science 1984 Aug;225(4663):705-706. 41. Karanja N, McCarron DA. Calcium and hypertension. Annu Rev Nutr 1986;6:475-494. 42. Orlov SN, Postnov YV. Ca2+ binding and membrane fluidity in essential and renal hypertension. Clin Sci (Lond) 1982 Sep;63(3):281-284. 43. Ellison DH, Shneidman R, Morris C, McCarron DA. Effects of calcium infusion on blood pressure in hypertensive and normotensive humans. Hypertension 1986 Jun;8(6):497-505. 44. Prada JA, Ross R, Clark KE. Hypocalcemia and pregnancy-induced hypertension produced by maternal fasting. Hypertension 1992 Nov;20(5):620-626. 45. Ritchie LD, King JC. Dietary calcium and pregnancy-induced hypertension: is there a relation? Am J Clin Nutr 2000 May;71(5)(Suppl):1371S-1374S. 46. Belizán JM, Villar J. The relationship between calcium intake and edema-, proteinuria-, and hypertension-getosis: an hypothesis. Am J Clin Nutr 1980 Oct;33(10):2202-2210. 47. Eastell R, Edmonds CJ, de Chayal RC, McFadyen IR. Prolonged hypoparathyroidism presenting eventually as second trimester abortion. Br Med J (Clin Res Ed) 1985 Oct;291(6500):955-956. 48. Hacker AN, Fung EB, King JC. Role of calcium during pregnancy: maternal and fetal needs. Nutr Rev 2012 Jul;70(7):397-409. 49. Hofmeyr GJ, Duley L, Atallah A. Dietary calcium supplementation for prevention of pre-eclampsia and related problems: a systematic review and commentary. BJOG 2007 Aug;114(8):933-943. 50. Hertz-Picciotto I, Schramm M, Watt-Morse M, Chantala K, Anderson J, Osterloh J. Patterns and determinants of blood lead during pregnancy. Am J Epidemiol 2000 Nov;152(9):829-837. 51. Scholl TO, Chen X, Stein TP. Maternal calcium metabolic stress and fetal growth. Am J Clin Nutr 2014 Apr;99(4):918-925. 52. Hofmeyr GJ, Atallah AN, Duley L. Calcium supplementation during pregnancy to prevent hypertensive disorders and related problems. Cochrane Database Syst Rev 2006;(3):CD001059. 53. Hofmeyr GJ, Lawrie TA, Atallah ÁN, Duley L, Torloni MR. Calcium supplementation during pregnancy for preventing hypertensive disorders and related problems. Cochrane Database Syst Rev 2014 Jun;(6):CD001059. 54. Brunvand L, Quigstad E, Urdal P, Haug E. Vitamin D deficiency and fetal growth. Early Hum Dev 1996 Jul;45(1-2):27-33. 55. Sabour H, Hossein-Nezhad A, Maghbooli Z, Madani F, Mir E, Larijani B. Relationship between pregnancy outcomes and maternal vitamin D and calcium intake: A cross-sectional study. Gynecol Endocrinol 2006 Oct;22(10):585-589. 56. Chen Y, Zhu B, Wu X, Li S, Tao F. Association between maternal vitamin D deficiency and small for gestational age: evidence from a meta-analysis of prospective cohort studies. BMJ Open 2017 Aug;7(8):e016404. 57. Hatswell BL, Allan CA, Teng J, Wong P, Ebeling PR, Wallace EM, et al. Management of hypoparathyroidism in pregnancy and lactation - A report of 10 cases. Bone Rep 2015 Jun;3:15-19. 58. Taussig HB. Possible injury to the cardiovascular system from vitamin D. Ann Intern Med 1966 Dec;65(6):1195-1200. 59. Friedman WF, Mills LF. The relationship between vitamin D and the craniofacial and dental anomalies of the supravalvular aortic stenosis syndrome. Pediatrics 1969 Jan;43(1):12-18. 60. Bronsky D, Kiamko RT, Moncada R, Rosenthal IM. Intra-uterine hyperparathyroidism secondary to maternal hypoparathyroidism. Pediatrics 1968 Oct;42(4):606-613. 61. Stuart C, Aceto T Jr, Kuhn JP, Terplan K. Intrauterine hyperparathyroidism. Postmortem findings in two cases. Am J Dis Child 1979 Jan;133(1):67-70. 62. Moncrieff M, Fadahunsi TO. Congenital rickets due to maternal vitamin D deficiency. Arch Dis Child 1974 Oct;49(10):810-811. 63. Callies F, Arlt W, Scholz HJ, Reincke M, Allolio B. Management of hypoparathyroidism during pregnancy–report of twelve cases. Eur J Endocrinol 1998 Sep;139(3):284-289. 64. Pitkin RM. Calcium metabolism in pregnancy and the perinatal period: a review. Am J Obstet Gynecol 1985 Jan;151(1):99-109. 65. Bilezikian JP, Khan A, Potts JT Jr, Brandi ML, Clarke BL, Shoback D, et al. Hypoparathyroidism in the adult: epidemiology, diagnosis, pathophysiology, target-organ involvement, treatment, and challenges for future research. J Bone Miner Res 2011 Oct;26(10):2317-2337. 66. The Prescribing Information for FORTEO (teriparatide). [cited 2018 September 17]. Available from: https://www.accessdata.fda.gov/drugsatfda_docs/nda/2008/021318Orig1s016.pdf. 67. Ilany J, Vered I, Cohen O. The effect of continuous subcutaneous recombinant PTH (1-34) infusion during pregnancy on calcium homeostasis - a case report. Gynecol Endocrinol 2013 Sep;29(9):807-810. 68. Bodenner D, Redman C, Riggs A. Teriparatide in the management of osteoporosis. Clin Interv Aging 2007;2(4):499-507.